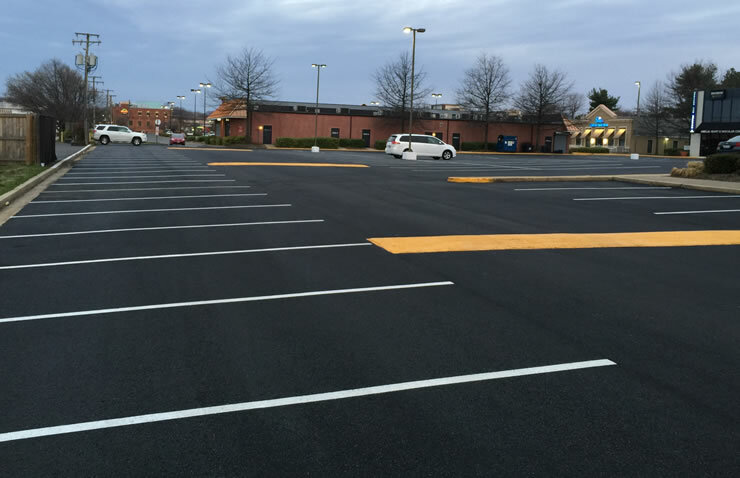 Photo – Premier Plaza Milling and Paving Work in Ashburn, VA.
A recent report surveying differences between the fuel economy of vehicles traveling on concrete vs. different types of asphalt surfaces noted that the smoothest asphalt was able to lower fuel consumption by almost 5%. This is because it lowers friction and resistance to the tires moving over the surface. Surprisingly, smooth asphalt actually saved drivers more fuel (and therefore, money and emissions) than regular tire pressure, rotation and alignment maintenance on the vehicles themselves—that only contributed a 1% improvement in efficiency. Heavy traffic can take a toll on any frequently-driven surface—as can the elements. But smoother, more uniformly installed pavement stands up better and longer to both of these pressures. The weight and pressure of heavy vehicles over smooth asphalt is more evenly distributed and less likely to cause deterioration in weak areas because smoother pavement is more uniformly strong over a larger area. And speaking of weak areas, smoother asphalt contains fewer of them. The development of stress cracking, which can allow water, ice melt chemicals and other debris to work its way under the pavement happens far less frequently with well-installed, smooth asphalt. These cracks, if left unchecked, usually turn into alligator cracking and eventually potholes, each of which is progressively more expensive to repair. Clearly, the smoother the asphalt, the lower the repair and maintenance costs will be over the long term. Whether you run a town or a homeowner’s association or a business of any kind, you know that liability issues are always to be avoided if at all possible—they are not only expensive and time consuming, but they can cause real harm to people and property. Again, smooth asphalt, with its safer, more uniform driving surface is easier to drive on and presents fewer driving hazards. Smooth pavement saves on repair costs for the vehicle owners, and prevents potential liability problems if a driver’s car becomes damaged or somebody is injured due to pothole-laden, poorly-maintained asphalt. If your town or business needs to have its pavement repaired or reinstalled, contact Espina Paving today at (703) 491-9100 and we can provide you a free estimate and show you ways that you can save money with smoother asphalt pavement.